Sometimes you take a chance and it pays sweetly. Bringing How&Nosm to Palestine over the past two weeks was one of them, and I believe they feel the same, as they also didn’t know exactly what they were setting themselves up for. 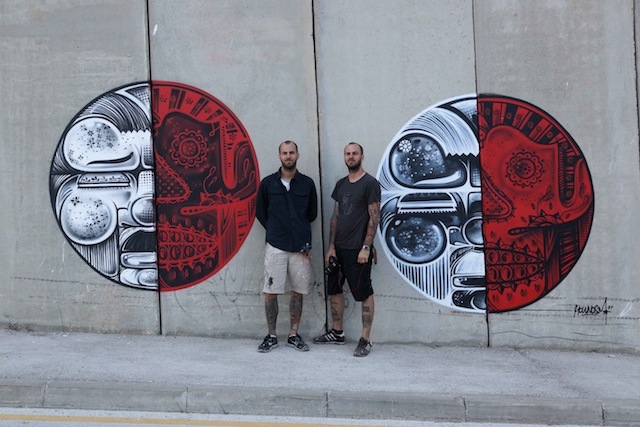 Almost a year ago, I first met the Perré twins, Raoul and Davide, while doing an article about Prague’s ‘Stuck on the City’ street art exhibition. We got talking about politics and the Palestinian-Israeli conflict, and I eventually asked whether they would ever consider collaborating with the UK-based charity I had just begun working for, Medical Aid for Palestinians (MAP), doing art workshops with MAP’s local partners in Palestine. “Sure,” they said. 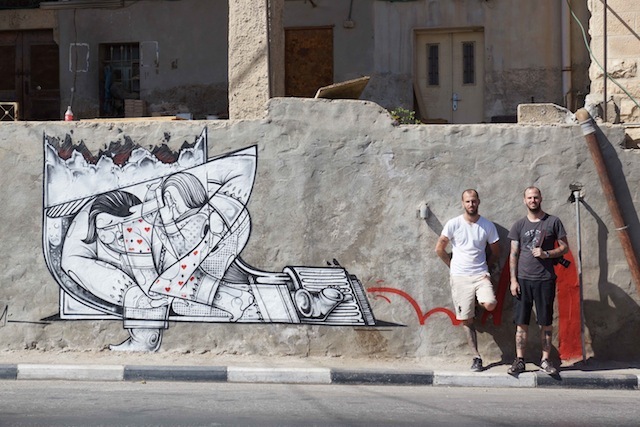 It would give them a chance to also do their own artwork on walls around Palestine. Within minutes we were in the car for central Tel Aviv to get them a pre-order of cans in their signature colours. Three young guys running the shop were clearly honoured to have How&Nosm on their turf and volunteered to guide them to the best places to bomb. “What have you got planned?” one asked. “We’re here for some work,” said Nosm, keeping schtum. They clearly wanted to paint with them but Nosm took their numbers and said they’d be in touch. We filled the trunk with boxes of spray cans and headed for occupied Palestine. Their natural environment is the street so I shouldn’t have been surprised that How&Nosm were keen to check into their East Jerusalem hotel, grab a quick shower and then head immediately to Bethlehem to sort out more paint, rollers, ladders and walls to paint – despite having travelled for about 20 hours by this time. 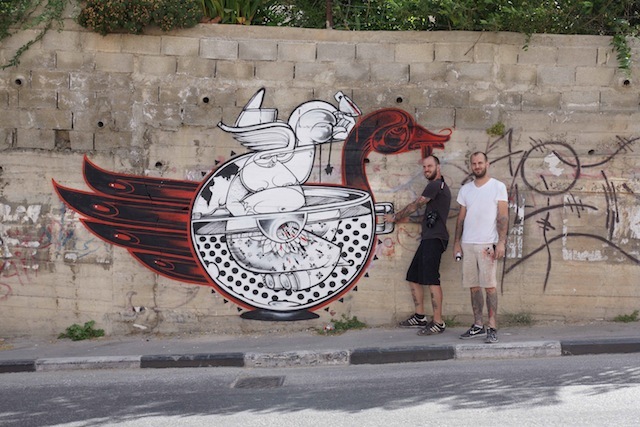 We met a Palestinian street artist who goes by the name ‘Trash’ – he worked with Banksy to sort out his 2007 Santa’s Ghetto project in Bethlehem, and has also helped JR with several local projects. As dusk fell, Trash gave them a quick tour of ideal spots to do murals and arranged to meet the twins the following morning. 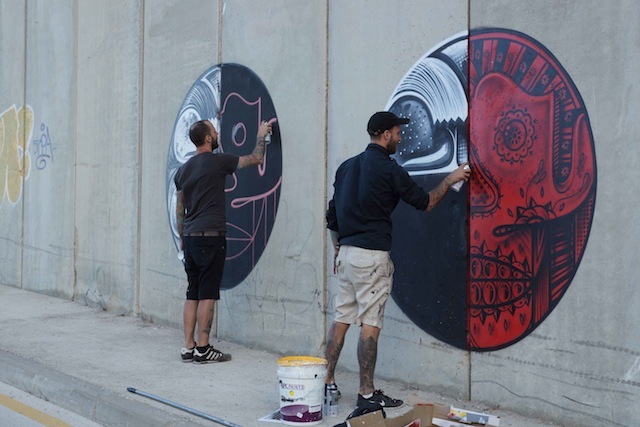 Over the next two days they produced three murals around Bethlehem – the largest ‘Lost Conversation’, as well as ‘In Mother’s Hands’ and ‘While Drinking Tea’ – and one in East Jerusalem, ‘Split Identities’. Locals would stop and talk to them, as usual, asking where they’re from, why they’re here, what the intricate images mean. But with four murals done, it was down to other serious business. More is Not Enough. Click to view large. What How&Nosm witnessed for themselves as we drove through the occupied West Bank – scores of illegal Israeli outposts and settlements built on Palestinian land, the scandalous route of Israel’s illegal separation wall, seeing the freedoms that Israelis enjoy at the expense of Palestinians’ human rights, and hearing of Palestinian homes being demolished or taken over by Israeli settlers, shocked them deeply. They spent one day with a former Israeli military commander, Yehuda Shaul, who co-founded an Israeli human rights organization called ‘Breaking the Silence’. He drove them to the southern point of the West Bank and, throughout the journey, gave them a clear understanding of the layers of Israeli occupation and their intended impact on Palestinian communities – ethnic cleansing. I spent many days in the car with How&Nosm, talking about the situation among other things, and you could see their frustration and outrage growing with every mile covered as the occupation unfolded before their eyes. 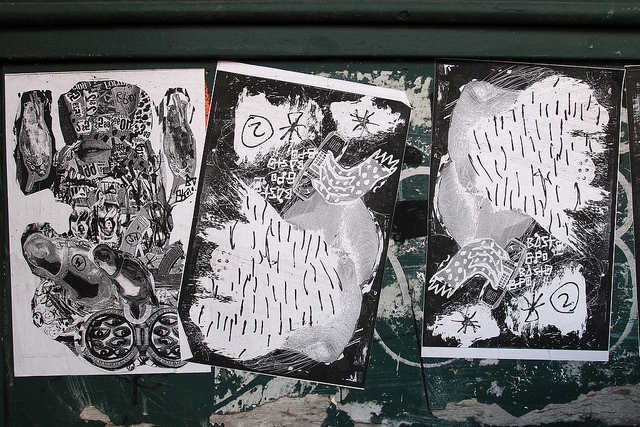 Very nice set of matching abstract pieces by CDB, Wood and Graphic Surgery. I love this GR170 mural. 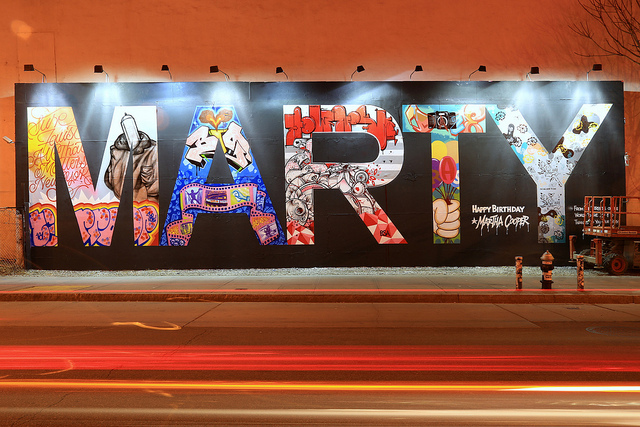 Looks like what a massive THR crew mural might look like if graffiti crews like THR were invited to mural festivals. 1xRun is doing a series of prints with members of The Weird crew. These two by Vidam and Dxtr are probably my favorites. I find Above’s work to be very hit or miss, and this hits the spot for me. Eine brought back some old imagery about children and CCTV cameras for his recent show at CHG Circa. Definitely check out this video of Anthony Lister at the Oi You Street Art Festival. These paintings on and of trains by Jens Besser are awesome. This tweet by Marina Galperina is perfect. On a similar note, earlier this week on Arrested Motion there were three posts out of five in a row that were basically about advertisements that involved artists: How&Nosm’s massive DKNY billboard in Times Square, KAWS’ put his logo on the MTV VMA Moonman sculpture because blah and El Mac painted street-level billboard for some FX tv show. Good for these guys getting paychecks I guess. I mean, KAWS never has to innovate for the rest of his life if he doesn’t feel like it, but I still don’t like billboards and I think it’s a bit ridiculous for people to be getting all excited about KAWS’ version of the Moonman. The Wall Therapy mural project in Rochester, NY is working on a short documentary about this year’s event, and they’ve recently released a trailer for that film. Station 16 recently released Hanksy’s latest print. I absolutely love this collaboration in London between Stinkfish, Cranio, Aeon Fly, and Dscreet. 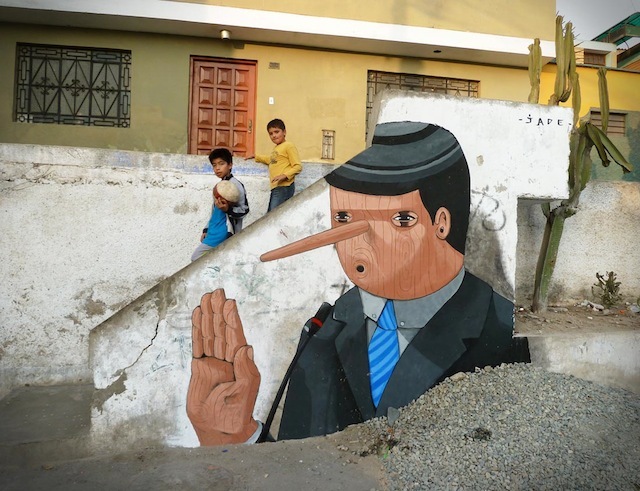 Vitche’s latest mural in Sao Paulo has some interesting elements that pop off the wall a bit. If you’re a fan of Horfe, you’ve got to check out this video of the Peace And Love crew, of which Horfe is a member. 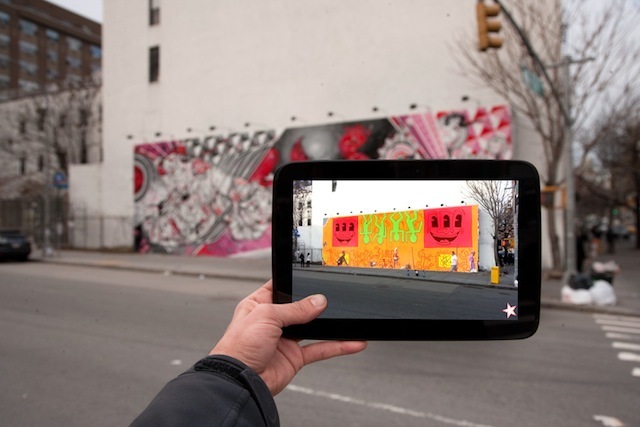 How and Nosm are the latest artists to paint the wall at Bowery and Houston. KAWS has work on the outside of a NYC subway car, but not in the way you might be hoping, just the way you’d expect. 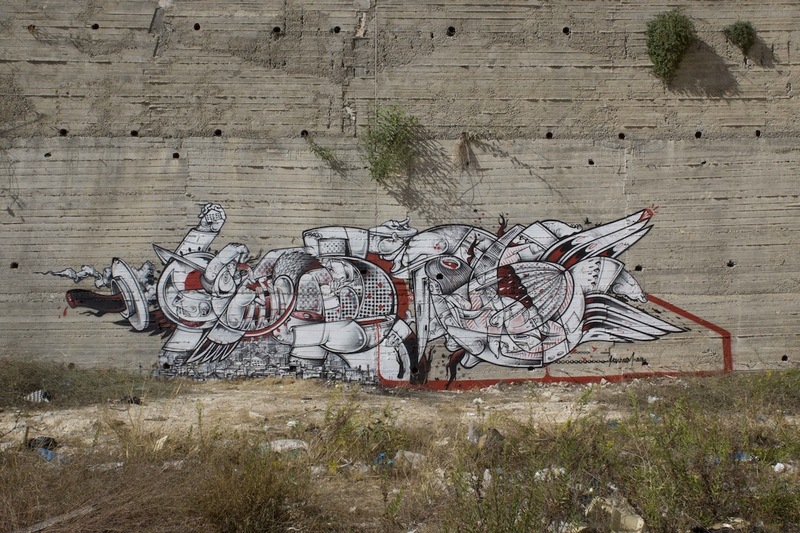 Erica il Cane and Blu have collaborated once again, this time on a mural in Bari, Italy. Hell yes: Two trucks painted by Aryz. A zoo in Turin, Italy closed down. This is what happened when artists were given access. A very late link-o-rama, but hey, Sunday is still the weekend. Stained glass street art? It’s a thing now. Rowdy has a show coming up in a few days in Newcastle, UK. 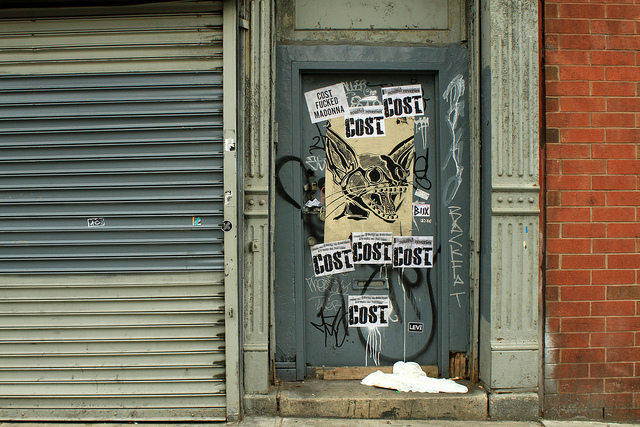 How and Nosm are the latest artists to paint at Bowery and Houston, and they have a new print out at Papermonster. 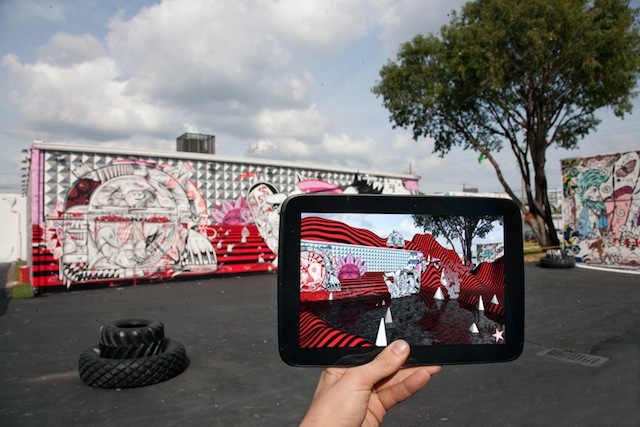 Eyebeam and F.A.T. 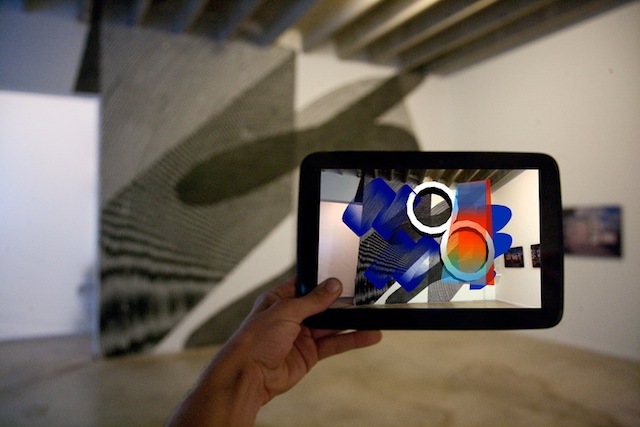 Lab are two awesome organizations combining art and technology, and now F.A.T. Lab have a show about to open at Eyebeam. One more reason I am excited to go to NYC this coming weekend. This show was postponed due to the Hurricane. You can see the full results of Bonham’s LA urban art auction here, but two highlights were this REVS/COST piece going for over $30,000 and Chaz Bojórquez’ classic Señor Suerte painting selling for $50,000. Bumblebee & Zio Ziegler painted this beautiful collaboration in LA. Kind of reminds me of Stinkfish. Horfe’s show in Paris looks top notch. 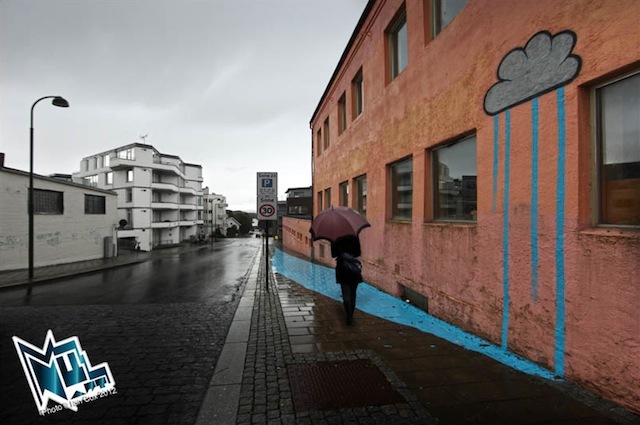 There’s a huge (271 meters long) wall in Copenhagen available to paint. Submit a proposal here. Interesni Kazki and Liqen are collaborating in Ukraine. 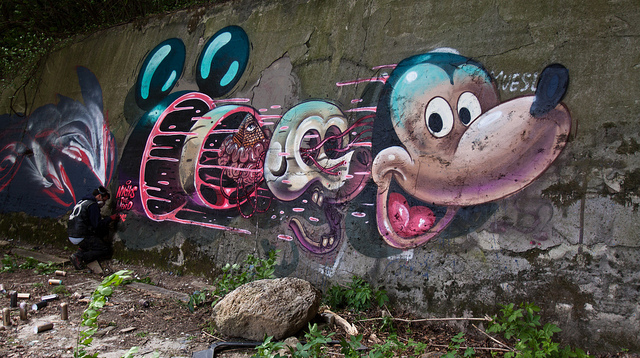 Check out Lex and Sten’s recent solo show in Paris. Raisin is painting some really cool abstract and geometric pieces around France. Askew, Deus, and Ryze painted some steps in New Zealand. Great to see steps being used for art rather than ads. 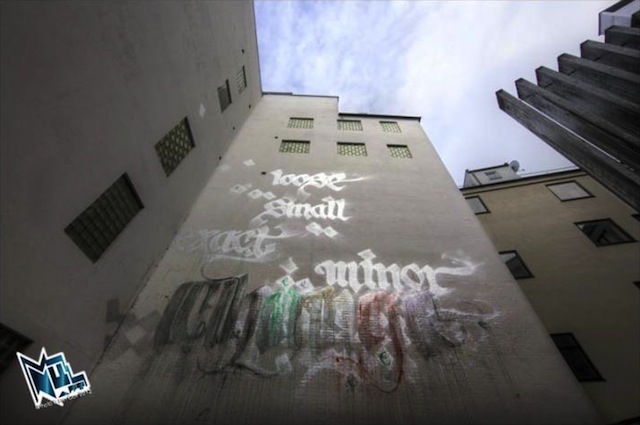 Niels “Shoe” Meulman paints a mural within sight of a former bank. Photo by Ian Cox. In part 4 of my series of posts about this year’s Nuart Festival (here are parts one, two, and three), I’ve finally gotten to the murals and more traditional street work of this year’s festival. 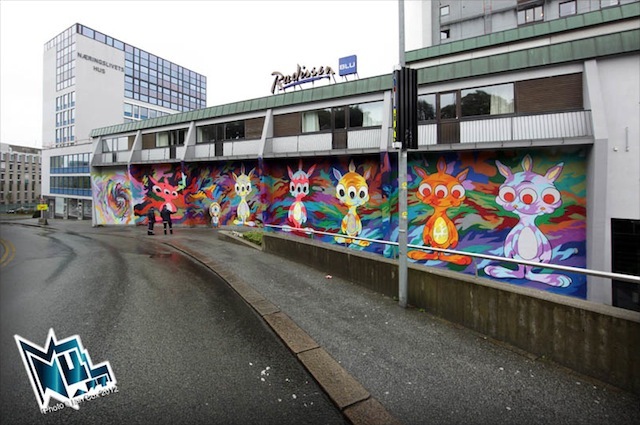 This year, Nuart is responsible for new murals in Stavanger by Niels “Shoe” Meulman, Ron English, Dolk, How&Nosm, Mobstr and Eine. Ron English. Photo by Ian Cox. 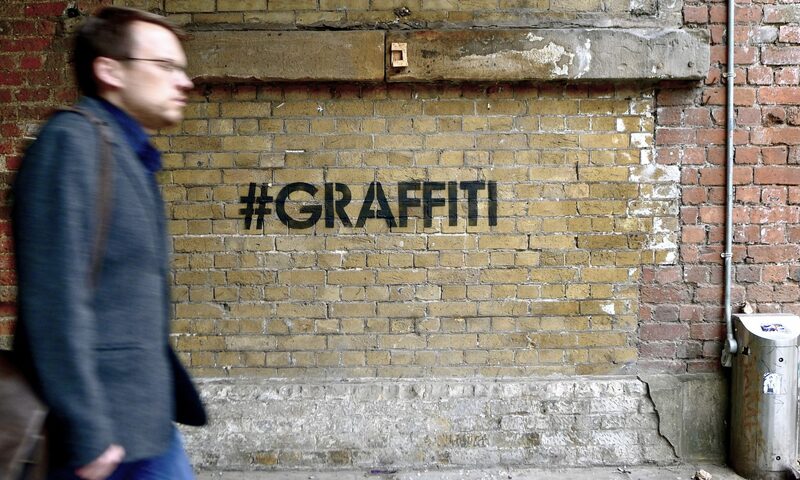 Mobstr. Photo by Ian Cox.